Kat's Retirement Journey: Little Mini Vacation? I have to quit taking these little mini vacations from blogging because those who know me start to worry that I might not be doing well. And, they might be right! I have been in a bit of a slump since a week ago yesterday. I should be easing out of it soon as they usually don't last more than two or at the longest three weeks. I think it has something to do with my Fibromyalgia but not sure. The last one I had was in July so the episodes are pretty far between. I feel really lazy. It takes me a lot longer to get anything done and I could literally sit in a chair and do virtually nothing for days. I become somewhat anti-social which is easy for me because I live in the middle of nowhere. Brain Fog--yuck! Thinking is really difficult so I try not to, thus not blogging. Walking on the treadmill (or anywhere) is very painful and difficult -- no energy. I have found that exercise it critical to living with Fibromyalgia so I push myself to exercise anyway. I can only stay in the Infrared Sauna for 20 minutes max before I have trouble breathing (but I do stay in for 20 minutes)! 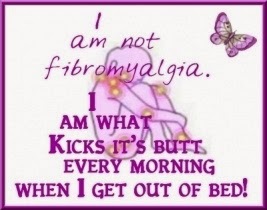 I know the sauna is going to help with the Fibromyalgia if I am consistent. I hurt everywhere but especially neck, shoulders and upper front thigh muscles and the intestinal issues...well, let's just say Not Good! I have some fun things coming up so need to get back to feeling good again. I will be linking up with Carla at My 1/2 Dozen Daily this month for her March Challenge: Take 3! I will be posting my goals for the Take 3 Challenge soon. If you get the idea I am Blog Stalking Carla, I am! I so admire so many things about her and love reading her blog posts and seeing her wonderful creations! Go Carla!!! I have a trip planned with my daughter and granddaughter March 30-April 3 to visit family in southern Oregon. I will be linking up for the A to Z Blogging Challenge for the month of April--six blog posts per week, blogging my way through the alphabet:) There are a lot of reasons to do the A to Z Blogging Challenge but my main one is it forces me to write and to write about things I might not normally write about. I am picking a theme this year and I think it will be Retirement--mine! Not written in stone yet so I am open to suggestions. I hope to be back tomorrow for Carla's Sunday Night Chit-Chat! Given that condition, it's understandable that from time to time, you'd be incommunicado. You're going to be busy! I try to go with the flow but sometimes it's easier to do than others! Yes, and the schedule for the next two months is filling up!